What Car Is Superman Trashing On The Action Comics No. 1 Cover? Superman's been on minds lately, what with that new movie and the story of a man finding an original Superman-introducing 1938 Action Comics 1 in the walls of his house, and that's got me thinking. You know what else is on the cover of Action Comics 1, other than a very strong man in ankle boots and a bodysuit? A car. Because of the caped and underpants'd fellow on that cover, very few people seem to pay much attention to that green car. It's not even entirely clear what's going on with that car. Sure, based on what I know about Superman, I can assume he's doing something constructive there, probably helping out the guy crouching in the green pants there. But if you didn't know about Superman, as people seeing this back in 1938 wouldn't have, it looks a lot more like some roided-up nut in a cape is smashing a car into some rocks, as people flee in head-clutching terror. But, even more importantly, what kind of car is that? After all these years, don't we deserve to know? I firmly believe in determining the makes of all cars we encounter in our culture, from Monopoly to money. Of course we deserve to know. So that's what I set out to find out. 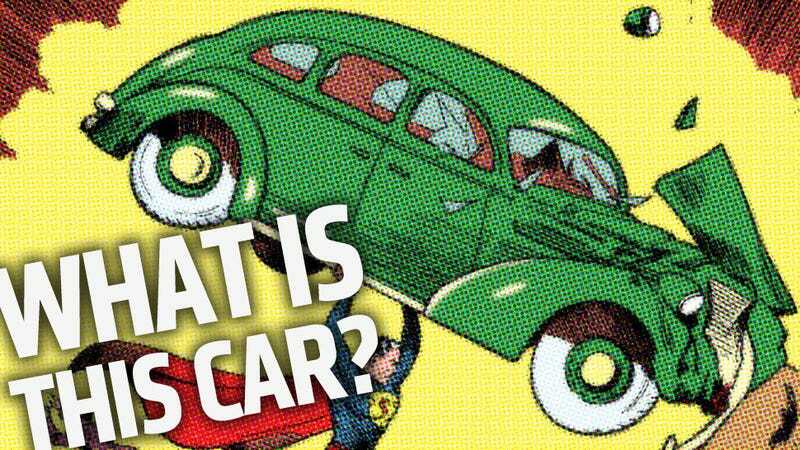 I think it's likely based on an actual car, since it makes sense that Joe Shuster, the artist, would have used photographic references for much of what he drew, as comic book artists did then and still do today. The car is clearly a late-30s car, though at first glance it really could be almost any American brand. If you often lament how alike so many cars look today, I'd suggest not wasting your precious time-travel research by going back to the 1930s, because many makes of cars looked alike then, too. The bulbous fenders, suicide doors, large, scarab-ish shape, tall grilles — all of these traits describe both the Action Comics car and a great number of American cars of the era. After configuring the Jalopnik dyna-satellite linkup and conferring with fellow auto historian Raph, we came up with some reasonable options. 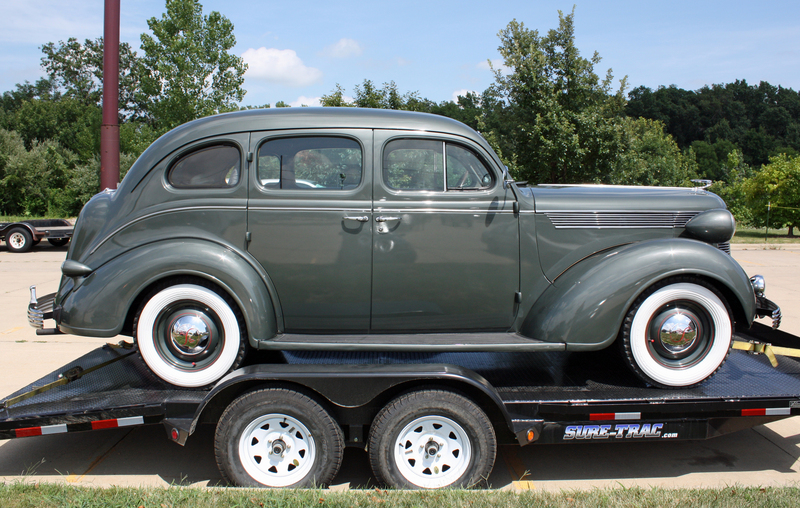 A '37-38 Chevy sedan was an earlier contender, and while the grille was a dead-on match, the split windshield suggested we needed to keep looking. Soon, it appeared that the most likely candidate for the car was something Mopar. Something like a 1937 Dodge, which was pretty damn close, save for the grille. But everything else matched up well — general shape, proportions, locations and style of trim and lighting equipment, etc. Luckily, Chrysler was lazily badge-engineering all sorts of these cars under different names with different trim and details. It was Googling these variants that I found that someone had already figured this out. So, instead of being disillusioned, I'm going to be encouraged. That car that Superman is making kiss those boulders, again and again, is, quite definitively, a 1937 DeSoto. At least two separate websites agree, and I think that counts as a majority on the internet. UPDATE: You commenters are making me second-guess things. There's some very compelling arguments that the car is a 1937 Plymouth (same body as DeSoto, different details), and I think a case can be made for a '37 Ford. So this may not be so settled after all.